Hahei has evolved from a peaceful Maori settlement to vibrant tourist destination. As more and more people discover the spectacular beauty of Hahei and Cathedral Cove, tourists from around the world will visit us. Also, more people are choosing to live in Hahei and surrounding areas. To deal with the tourist growth and needs of permanent residents, we must invest in the necessary infrastructure such as roads and vehicle parking, environmental protection. Building infrastructure takes a long time and we need a long term plan to ensure the appropriate infrastructure in ready when needed. According to Government legislation, every 3 years, TCDC must prepare a new Long Term Plan. The plan covers the next 10 years, and identifies key investments that will be required to deliver TCDC’s obligations as set out in the Local Government Act. More details of TCDC’s LTP 2018 – 2028 process can be found here. TCDC published a draft LTP on March 23. Hahei Residents & Ratepayers Assoc has reviewed the plan and prepared an alternative investment plan for Hahei. See Our Infrastructure Plan. As we negotiate with TCDC, we will update this page. In the long run, we believe we should explore if what it would mean to progressively make Hahei a Walkable Village. To understand the challenges all face click on the headings below. What Drives Hahei's Infrastructure Needs? Tourism Growth – Cathedral Cove has been used by many tourist organisation to promote New Zealand globally. As a result visitors to Cathedral Cove, have grown at around 30% pa over the last few years. Hahei is the gateway to Cathedral Cove, increasing the need for vehicle parking and other tourist facilities. In addtion, many properties owners now rent there properties. In year ending June 30, 2018, we are expecting 320,000 walkers to Cathedral Cove. At the current growth rate, it is likely that 0.5m will visit in 2023. To accomodate this number of tourists, we will need approximately 600- 800 vehicle parking spaces. The consequences of tourism growth has been large numbers of vehicles entering Hahei. 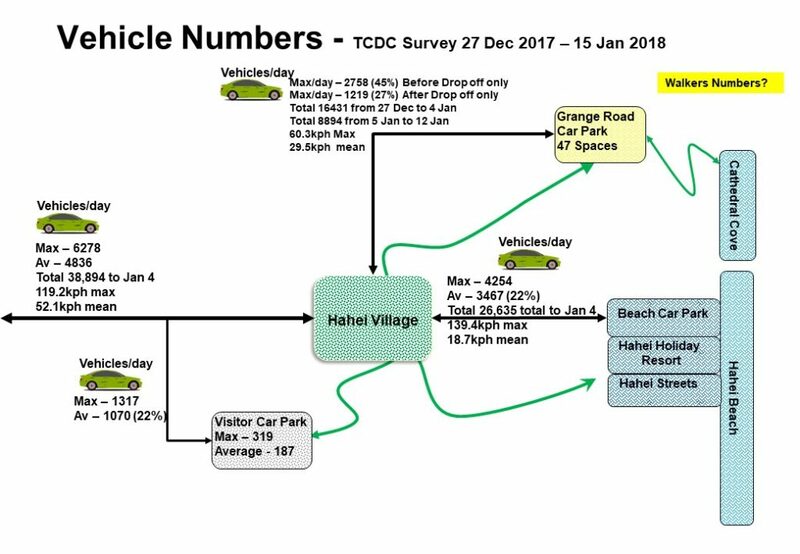 TCDC kindly arranged for a Traffic Survey over the busy summer period 2017/18. The results are shown below. Hahei Population Growth – permanent resident population and overnight tourists are growing. This places additional load on water and sewage treatment systems.